In her first musical appearance since 2009, the world was expecting Britney to explode back on to pop scene with her new single, ‘Hold It Against Me’. Well she certainly has created drama but not exactly in the way she had hoped. In fact things couldn’t have gone much worse as she is being sued in a multi-million dollar lawsuit! The song has been found to have “major similarities” to the 70’s hit by The Bellamy Brothers, ‘If I said you had a beautiful body would you hold it against me’. 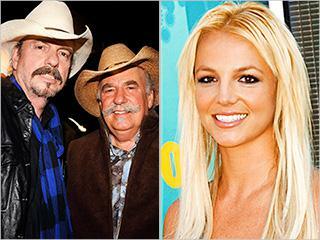 Apart from the obvious difference of Britney’s version being an electronically implemented tacky fest vs The 70’s country classic, the lyrics are undeniably similar and David and Howard Bellamy are planning on meeting with their lawyers to take action. It doesn’t seem that there’s any use in Britney shaking her buns in their faces either as David has openly said that their decision is already made,‘Howard and I have no personal beef with Britney. She’s a talented gal. But professionally we feel completely ripped off. We will without doubt take the appropriate legal action if our attorneys agree we’ve been ripped off. Britney who’s spokespeople have refused to make any comments yet flew back to her hometown of Louisiana last night with her kids and new beau Jason Trawick for a quick break from promoting her up coming album, ‘Femme Fatal’. An aggressive promotional campaign is ensuring that Britney will not flop again as the music video was released in the US on Thursday and 14 sneak previews have already been exposed. With overtime at the gym, her body is looking back to what we all used to envy but she is denying rumors that the dancer in parts of the video is actually a double. Several reports have said that Britney ran off the set in tears as she couldn’t complete the choreography. We think that everyone should give her a break! The woman’s had two kids for goodness sake! With what seems like drink and drugs as a thing of her past, it seems a shame that a small slip such as a multi million dollar lawsuit would take her back to square one.